Melbourne-based electronic producer Monkey Marc writes sonically rugged, politically charged music in his solar-powered studio by day, and plays it on his solar-powered soundsystem by night. 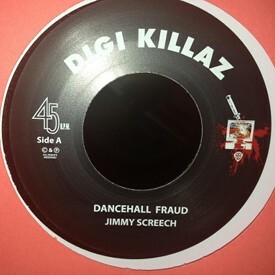 His sound has been likened to Prince Paul meets King Tubby with the bass turned up: hip hop meets dub and future bass. Gorilla Solar Studio, Melbourne. Recording session with Adrians Wall, Monkey Marc, Rogue Magnetic and YT. Photo: Francesco Vicenzi. E-mu SP-1200, Gorilla Solar Studio. Photo: Ionna Gwarek. Monkey Marc's production ranges from instrumental hip hop to dub-infused bass music and digital reggae. His influences range from an eclectic mix of world music to heavy dub basslines and boom bap style hip hop beats. Monkey Marc has produced music for artists including Roots Manuva, Soom T and YT, as well as being known as the mastermind behind political hip hop group Combat Wombat. Monkey Marc has released on labels including Big Dada/Ninja Tune (UK), Jahtari (Germany), Elefant Traks (Australia), Renegade Masters (UK), Ya Basta (France), No Fridge (France) and Omelette Records (Australia). Monkey Marc live at the Howler, Melbourne. Monkey Marc's first solo album, As the Market Crashed (Omelette Records 2009), is an reflective journey through brooding instrumental hip-hop, dub and dubstep. The album was recorded entirely on solar power in Melbourne, mixed in Paris at Sumroom Studios and Melbourne’s Head Gap Studio, and mastered in London at Transition Studios. It takes influences from a worldly palette, with elements of blues, jazz and world music scattered across instrumental beats, futuristic basslines and shimmering stepped-out rhythms. Underpinning the album is a strong message for social and environmental change, drawing upon samples that cover the global financial crises, the inequality of political systems and the world's addiction to fossil fuels. 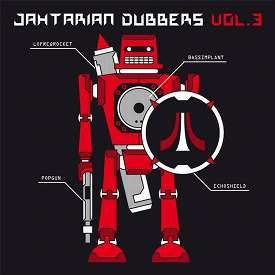 His follow-up solo EP, Monkey Marc vs The Planet Smashers (2013), was released on Germany’s legendary Leipzig-based underground label Jahtari. Equal parts late 90s hip hop and new school dub, faithfully recorded to cassette and dubbed out to the max by Disrupt, it includes a dub of Roots Manuva's "Who Goes There" from his LP 4everevolution. 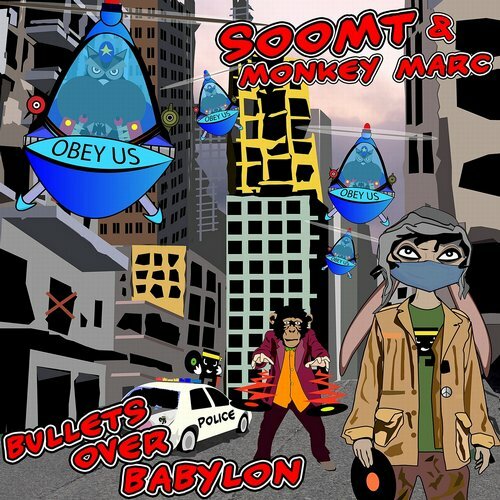 His most recent release, Bullets Over Babylon (Renegade Masters 2015), is a long-awaited collaboration with UK powerhouse Soom T. This dystopian bass manifesto features Soom T's powerful activist hip hop and jazz underpinnings coupled with Monkey's post-apocalytic production. Monkey is currently working on a conscious hip hop project with UK reggae legend YT. Monkey Marc with Dub FX (right), live at The World Beyond, Revolt Artspace, Melbourne. Photo: Francesco Vicenzi. Mixing at Gorilla Solar Studio. Photo: Francesco Vicenzi. Monkey Marc and Elf Tranzporter at Symbiosis Gathering, California, USA. Monkey Marc began producing music with a tape machine and a one-second-sampler in the late 90s, when his passion for bass lead him towards the sounds of jungle, breaks and hip hop. He eventually bought himself a drum machine when he couldn’t find the records he was looking for. His love of music and his strong political ideals led him to co-found the travelling Labrats solar-powered sound system with Izzy Brown in 1998. They travelled across the country to the front of protests and blockades, running huge parties with the solar and wind-powered sound system and cinema, in areas as remote as the Roxby Downs uranium mine to many forest blockades throughout southern Australia. During this time, they pioneered the use of vegetable oil to fuel the Labrats vehicle, and were one of the first to navigate around Australia solely by using vegetable oil as a fuel. Following his dreams in music production, Monkey formed political hip hop group Combat Wombat in the late 1990's with MC Izzy in Darwin. 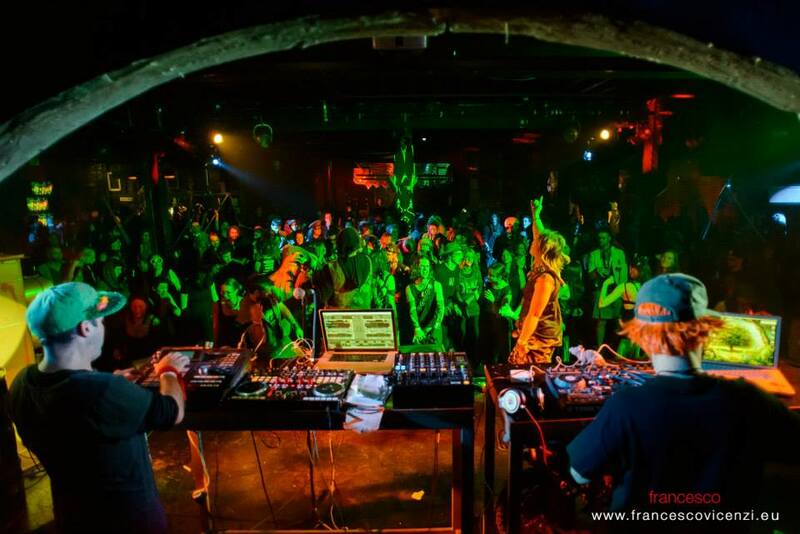 After meeting Elf Tranzporter in the Sydney Broadway Squat scene in 2000, and meeting DJ Wasabi in 2001 when doing a Labrats party in Newcastle, the crew was complete. He released a single called Miraculous Activist with the crew and eventually a full-length feature album by Combat Wombat entitled Unsound System (Elefant Traks 2005). In 2009, he established a solar-powered recording studio in a converted shipping container in Melbourne, now available for mixing and mastering services. He co-founded the DIY Hi Fi soundsystem in 2013: a fully off-grid, full-range solar and wind-powered soundsystem. 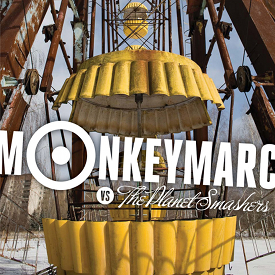 Monkey Marc has played in clubs, pubs, festivals, squats and street parties across the planet. Some of these include Glastonbury (UK), Fusion Festival (DE), Rainbow Serpent (Aus), Big Day Out (Aus), Symbiosis Gathering (USA), Boom Festival (Portugal) and many more. Monkey Marc's passion for social change and music has also taken him far across the Australian outback. He currently spends up to six months of the year running music workshops with indigenous youth and elders in remote Aboriginal communities. Desert Sevens from Ampilatwatja, NT. Photo: Monkey Marc. For over 15 years, Monkey Marc has worked with indigenous youth and elders in more than 30 communities around Australia. He has run songwriting, music recording and video editing workshops, using hip hop, reggae and rock music as an outlet for creativity in these remote communities. Monkey Marc pioneered Transfer of Knowledge projects, which transform traditional Dreamtime stories into modern songs. This helps to strengthen, preserve and reinvigorate sacred indigenous knowledge. His work has brought him to remote communities including Punmu, Parngurr and Papunya (WA), Kintore, Yuendumu, Nyrripi and Ampilatwatja (NT), Mimili (SA), Palm Island and Arrakoon (QLD) and Wilcania (NSW). His work on the Barkly Desert Cultures project for the Barkly Regional Council, NT, was recognised by a 2015 National Award for Local Government in the category of Arts Animates—excellence in community engagement and participation. This includes his ongoing work and mentorship program teaching sound production and producing hip hop with the Desert Sevens (D7's) from Ampilatwatja, NT. Check out more on the workshops and videos from these community projects. Monkey Marc workshop with the Desert Sevens in the Ampilatwatja studio, NT.